PHOENIX (AP) — Arizona Gov. Doug Ducey suspended Uber’s self-driving vehicle testing privileges Monday in the wake of a pedestrian fatality in a Phoenix suburb last week. Ducey said in a letter to CEO Dara Khosrowshahi that video footage of the crash raised concerns about the San Francisco-based company’s ability to safely test its technology in Arizona. He said he expects public safety to be the top priority for those who operate self-driving cars. “The incident that took place on March 18 is an unquestionable failure to comply with this expectation,” Ducey said. The move by the Republican governor marks a major step back from his embrace of self-driving vehicles. He previously welcomed Uber and other autonomous vehicle companies to use Arizona as a place for testing under few, if any, regulations. In early March, he authorized self-driving vehicle companies to run tests without a person in the car to act as a safety operator. On March 21, police in Tempe released a 22-second video showing a woman walking from a darkened area onto a street just before an Uber SUV strikes her. The Volvo was in self-driving mode with a human backup driver at the wheel when it struck 49-year-old Elaine Herzberg, police said. The human backup driver appears to be looking down until just before the time of the impact. 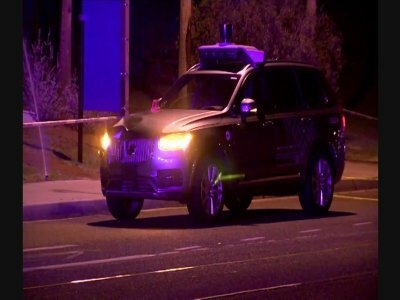 The fatal crash in Tempe was the first fatality involving a self-driving vehicle in the United States. Uber immediately suspended its self-driving vehicle testing in Arizona, Pittsburgh, San Francisco and Toronto. If Uber resumes its self-driving vehicle testing, the governor’s decision means the company will still be prevented from doing so in Arizona, said Ducey’s spokesman Daniel Scarpinato. The crash is being investigated by Tempe police, the National Transportation Safety Board and the National Highway Traffic Safety Administration. Experts who viewed the video told The Associated Press that the SUV’s sensors should have seen the woman pushing a bicycle and braked before the impact even though it was at night. On Friday, The New York Times reported that the company’s own documents showed the testing program was rife with issues. They included trouble driving through construction zones and requiring far more human intervention than competing companies. In Arizona, companies such as Uber only need to carry minimum liability insurance to operate self-driving cars. They are not required to track crashes or report any information to the state. Scarpinato said Monday that Ducey considers self-driving vehicles a way to improve public safety and limit road fatalities. “We see real long-term benefits to it, and we want to know more about this incident, whether it was an outlier or not,” he said. But he wouldn’t say if the governor regretted not having state reporting requirements that could have given advance warning of the problems with Uber’s program reported by the New York Times. California requires added insurance, reports of all accidents regardless of the severity and an annual report showing how many times operators had to take over from the computers. Scarpinato said called Ducey’s action “aggressive” but declined to say if the governor was reconsidering requiring more oversight.